In this video, you’re going to learn how to make a DIY wireless microphone for your GoPro, iPhone, mirrorless or DSLR camera, or even a point and shoot camera with the Edutige ETM-006. It seems that wireless microphones are all the rage now, and that’s understandable… The convenience of a wireless microphone for your GoPro, iPhone or DSLR is something that most everyone that has ever shot a video would appreciate. First, you’re free to move around and not worry about wires. Wireless microphones also sound great because the mic is attached to you, 6-8 inches from your mouth. Plus, if you’re shooting videos on your own or you’re doing any kind of run-and-gun style reporting or videos, a wireless system that’s ready to go at a moment’s notice and that is reliable is a huge advantage. Yea, but aren’t shotgun microphones better? NO! Well, it always depends on the situation, but this DIY wireless microphone is better than a shotgun microphone for interviews, talking head videos, tutorials, reviews, travel videos, etc. because you don’t need to be close to where the mic is. What most people don’t realize is that a shotgun microphone works best when your subject is about 3 feet from the microphone. Plus, you have to be directly in front of the microphone or your voice won’t get picked up very well. That’s why professionals use a shotgun microphone on a boom pole, often times with a boom pole operator whose job it is to ensure the shotgun mic stays within that 3 foot sweet spot. But wireless mics are expensive, aren’t they? Yes, traditional wireless microphone systems for video are expensive, usually starting at US$400 and going up. But you can make your own wireless microphone system with audio quality that rivals, and that may even surpass those expensive systems for just $153. Plus, this DIY wireless microphone works flawlessly, isn’t affected by radio or cellular interference and WILL WORK WITH ANY CAMERA. There is not a single camera on earth that won’t work with this DIY wireless microphone. What is this miracle of a DIY wireless microphone? It’s quite simply an Edutige ETM-006 omnidirectional lavalier microphone plugged into a Zoom H1 digital voice recorder. That’s it!!??? Well, yes, in fact it is. What the heck is so great about the ETM-006 and the Zoom H1? The Zoom H1 is what I recommend because it fits in your pocket, is easy to use, has a line in jack for an external microphone, and it produces great quality audio for only $100 as of this writing. First… All you have to do is plug the ETM-006 into the Zoom H1 and you’re practically ready to go. You just need to clip the ETM-006 somewhere within 6-8 inches of the person’s mouth. It’s that easy. Second… Manually adjust the input volume so the volume peaks at about -12 decibels. With the ETM-006, that’s usually an input gain setting of between 20-25 on the Zoom H1, but that depends on how loud your subject is going to talk. If you’re interviewing someone, you can ask them a few general questions and ask them to speak at a normal level. If you’re in a situation where you don’t have time to set the Zoom H1’s input level, then use the H1’s Auto Level function. But ideally you’ll want to set the levels yourself because when there isn’t any sound, the H1 will increase the recording volume on its own, which can cause some noise to get into your recording. Hit record on the Zoom H1 and your camera. Then put the Zoom H1 in a jacket pocket, in a case with a belt clip, or in your back pocket. Finally, clap three times. These claps are like a movie clapper and the audio spikes will be used to sync your audio. Now record your video and when you’re done, stop recording on both the H1 and your camera. 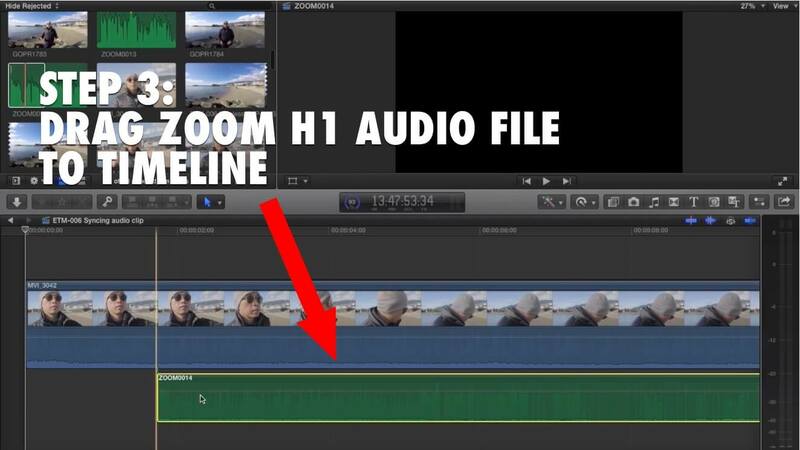 Now here’s the easy part… syncing the audio from the Zoom H1 with your camera’s audio. You might think this is hard, but it’s probably a 20 second process and even faster if your video editing software has a synchronize feature like Final Cut Pro X does. 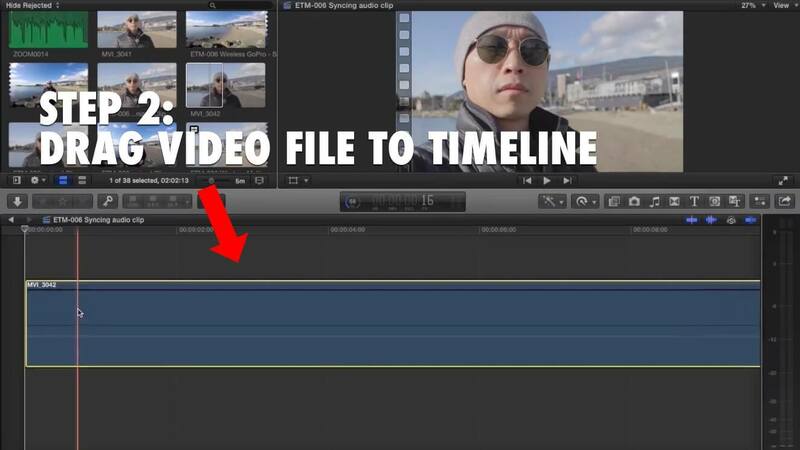 Drag and drop the video file into the editing timeline and then drag and drop the matching audio file from the H1 below your video. Find the three claps you made and move the audio file until the claps line up. 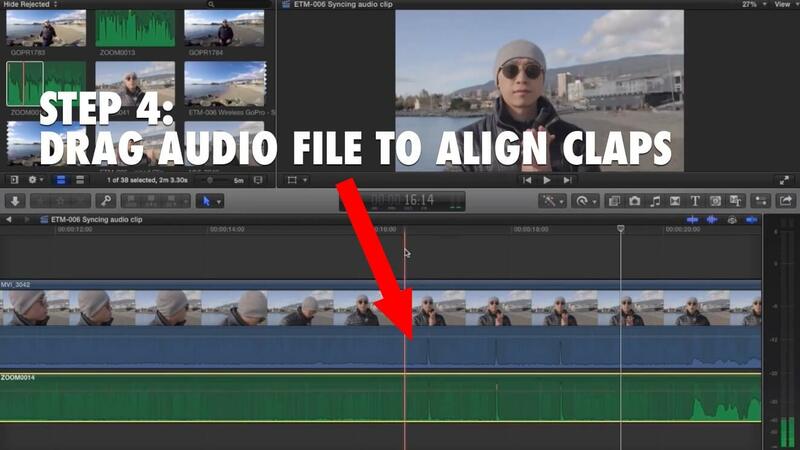 Play the file and move the audio track until your audio is perfectly aligned. 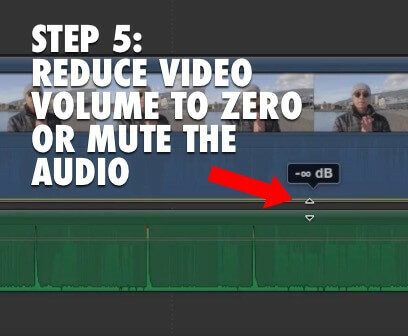 Finally, mute or reduce the volume from the camera’s audio so you’re left with the audio from the H1. The three claps you made are important because they make it so easy to line up your audio tracks. 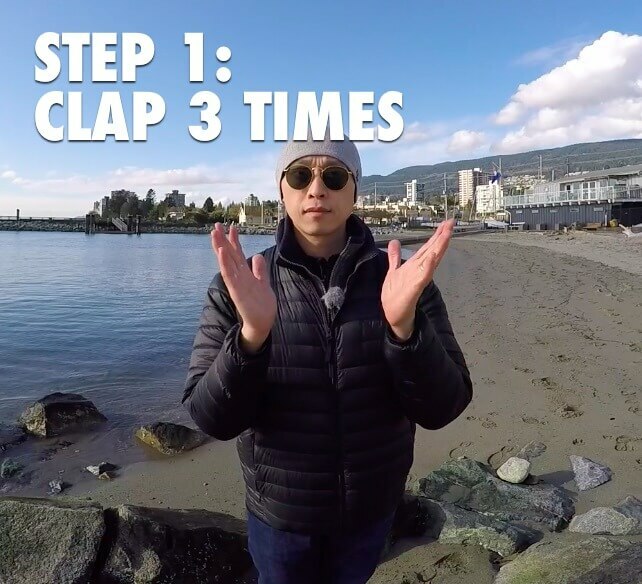 One clap can work too, but three makes is super easy. That’s how to make a DIY wireless microphone for your GoPro, iPhone, mirrorless or DSLR camera, or even a point and shoot camera with the Edutige ETM-006 and a Zoom H1 digital voice recorder… and all for only $153!